Where we dig for value in frontier digital markets. Depth. Accessibility. Quality. That's the Xalam way. 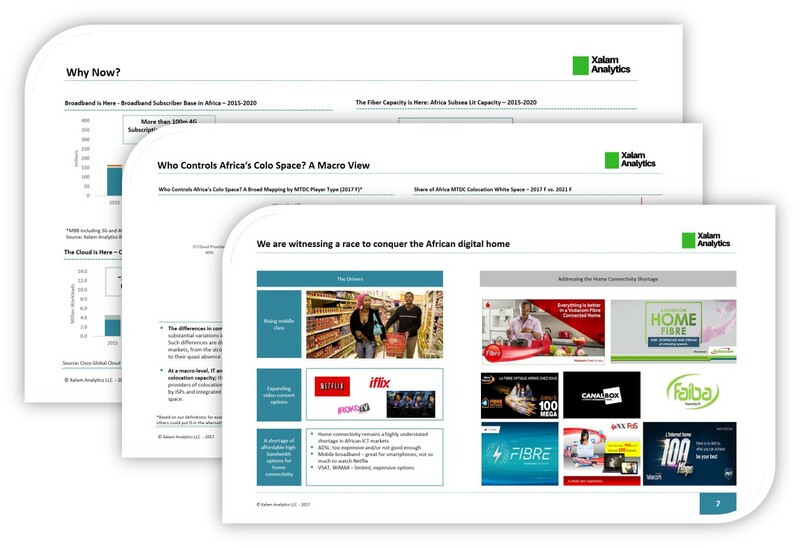 Our flagship investor reports provide an in-depth assessment of opportunities in specific digital market segments. We analyze market patterns and projections, business models, regulatory impact, investment returns and more. Our reports are full of data, and use extensive combinations of charts, maps, bullet points and unvarnished written style to get you to the bottom line. Our aim is to make the analysis easy to absorb, yet comprehensive enough to remain a reference document that can be accessed multiple times. Xalam Premium Subscribers get full access to all our reports as part of their subscriptions. The second edition of our “Africa Data Center Rises” series, this report offers what we believe is the most comprehensive independent research available on the African Multi-Tenant Data Center (MTDC) colocation space. We say the rise of connectivity and the cloud are driving the race to bring the brains of the African Internet back to the continent, in the process transforming data center colocation into one of the hottest growth segments in the African ICT market. A reference document for any investor in African cloud and colocation markets, all in Xalam’s identifiable no-nonsense, data-driven, and economics-focused style. Get full details on report page, here. Part of Xalam Analytics’ “Future of the African Internet Series”, The Future of African Bandwidth Markets provides an unprecedented view into African international capacity business models. Using its trademark economics-focused, no-nonsense style, the Xalam research team explores key questions around the size of demand, the impact of capacity oversupply, the economic viability of proposed cable systems (SACS, SAIL, Liquid Sea, etc. 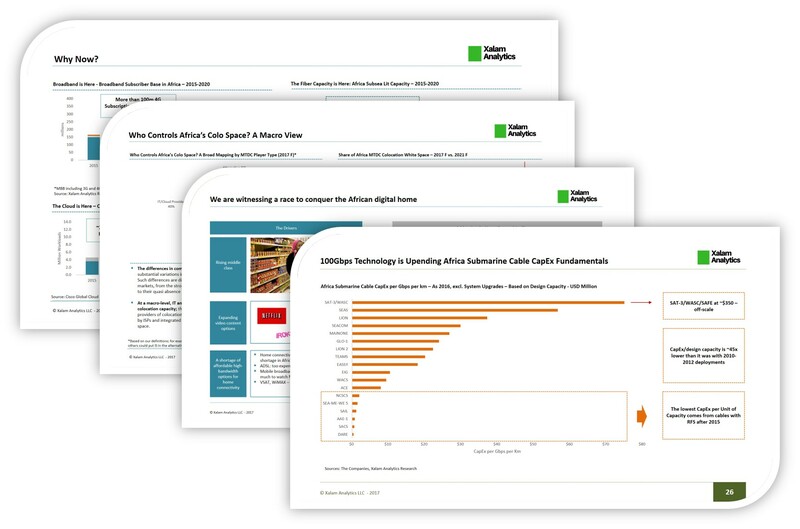 ), the future of African pure play capacity models, the impact of new wholesale capacity disruptors such as Angola Cables and Djibouti Telecom, how much lower international capacity price points can go, the impact of IXPs, which players will control African international capacity in 2020 – and much more. Get full details on report page, here. At long last, the African fibre boom is here. Arguably the most comprehensive analysis developed on the rise and impact of FTTH in African markets, “The African FTTH Boom” takes an extensive look at FTTH adoption patterns across the continent, including key infrastructure, business economics, winners and losers, market structure and regulatory drivers, current and projected levels of homes passed and connected. And much more. We have analyzed 60 spectrum transactions across 20 African markets over the past 10 years, covering 1100MHz worth of 3G and/or 4G spectrum. We say African countries are sitting on $5bn of 4G spectrum, estimate value for 4G auctions in Nigeria, South Africa, Egypt and other markets, and say spectrum asset companies should cash in on their assets while the value is high. The most extensive independent tool for intra-African spectrum transaction benchmarking and value analysis. Few companies outside of mobile network operators have done as much to transform the African Internet as Main One, Seacom, and Liquid Telecom. From the maturity of the international capacity market to the explosion of demand in the metro and the enterprise, their markets have now evolved, and so must they. This report analyzes how they go from here, strategic options available and M&A possibilities. The report examines the strategic options available to each of the three companies, based on international benchmarks, the dynamics of their core geographies and the state of their current network infrastructure and service portfolio. It also examines the consolidation potential of each of the fibercos, either as acquirers or as acquisition targets. Rarely has an industry been as celebrated as the African mobile industry over the past decade – and deservedly so. From its unprecedented ability to alter human interaction and communication, change the fabric of entire economic sectors, attract massive infrastructure investment, the contribution of the telecoms sector to African development over the past fifteen years has been truly transformational. And yet, even as the industry continues to bask under such well-deserved plaudits, seldom have the fundamentals that have long underpinned its success been so much under threat and its future so unremittingly cloudy. Our research suggests that the African mobile market has entered a phase of acute turbulence, at the exit of which many players will come transformed, no longer mere telecoms operators, but full-fledged platforms for digital service innovation. Others will not make this great trek, felled as they will be by the combined effect of OTT service cannibalization, destructive competition, regulatory apathy and shortsightedness, voracious and misguided tax policies, weak supporting infrastructure, shareholder impatience, and their own inability to acknowledge that they’re in trouble and act accordingly.